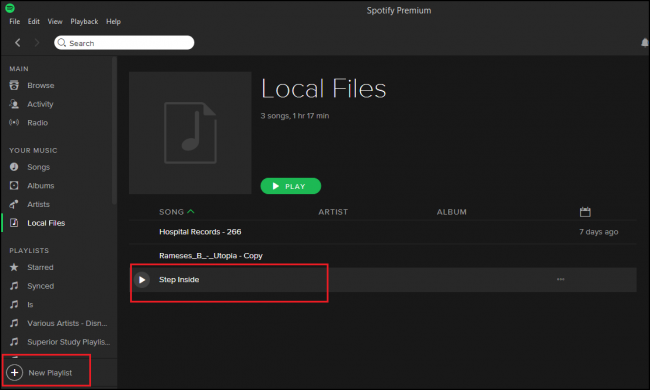 We’ve talked about all the ways you can add your own music to the iTunes/iCloud ecosystem, but did you know its closest competitor in the streaming space Spotify can do the same thing? By fuddling with a just few settings between your desktop and mobile devices, you can make any local files accessible from wherever you are in the world in an instant. First, make sure the song or songs you want to add are properly synced up in your desktop client and have been either recorded yourself, or you own the DRM rights to share it among multiple devices. Any songs with DRM restrictions will not be able to sync with the Spotify service and will only open in media players that are designed to put in DRM requests with central servers. 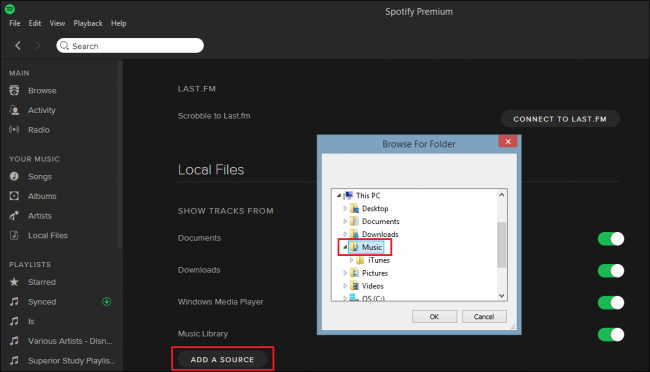 For Windows users, Spotify will automatically scan your Downloads, Documents, and Music folders for any potential tracks that might be stored on the machine. Mac users will need to load any files they want into their iTunes, My Music, or Downloads folder if they expect the service to catch them on its own. Any other folders can be added by going into Preferences, scrolling down to “Local Files” and clicking “Add a Source”, near the bottom. 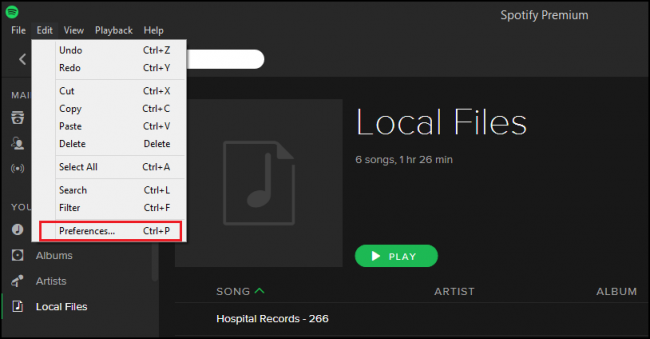 With the folder added, any non-DRM restricted music contained within will be immediately imported into the Spotify library, found under the “Local Files” tab in the main menu tree. Once you’ve added the music to your desktop’s library, you’ll need to create a new playlist to put it into. 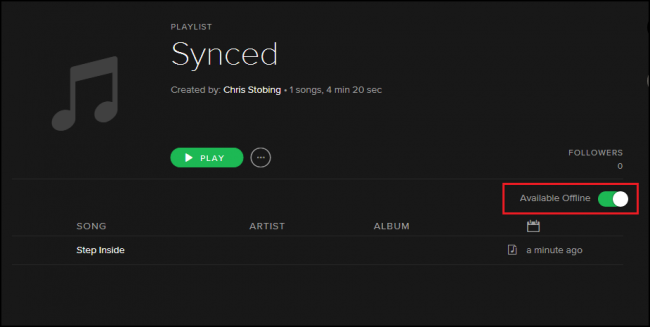 As an example, we’ve created a new playlist with the name “Synced”, with the song “Step Inside” by Rameses B by clicking the “New Playlist” button down in the bottom left-hand corner of the Windows desktop client. 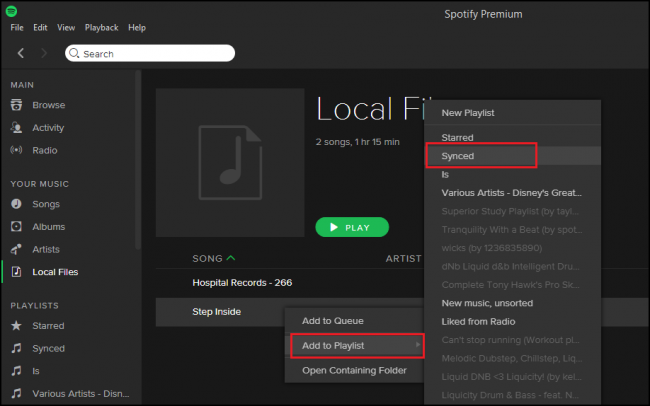 Once the playlist is ready, jump back over to the Local Files tab, and add the song you want synced to the playlist you intend on streaming from. Be sure that when you activate the toggle, both your desktop and the device you wish to sync to are both on the local WiFi network. 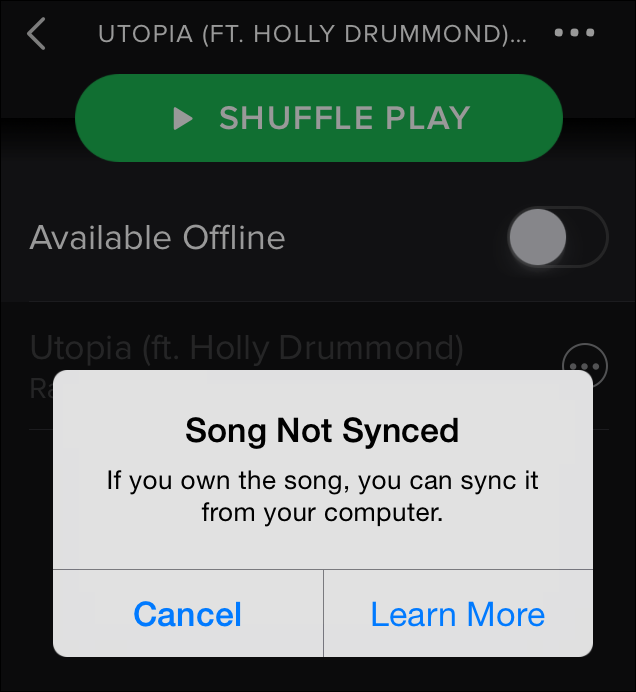 Spotify will attempt to communicate licenses and DRM requests over this protocol, and the system won’t let you sync anything unless both are tied to the same wireless MAC address. This process can take anywhere from 30 seconds to several hours, depending on the size of your playlist and the fidelity of the songs inside. Once complete, you’ll now be able to access your local files on any devices which are registered to your account, as well as mix them up with as many songs as you’d like from Spotify’s streaming archive to create one of a kind listening experiences of your very own! 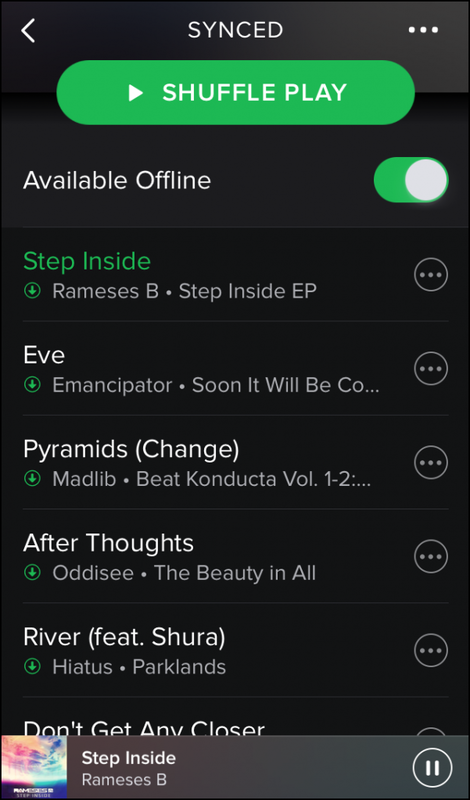 As of the latest update for Spotify mobile, users have been reporting some issues with getting the songs they’ve added on the desktop to appear as playable when checking the playlist from their phones. There have been a number of proposed fixes, and when writing this article I found myself searching for the same answers as it took some doing to get everything up and running smoothly. Once these are cleared, you should have no problems getting the sync system to stream any local files from your desktop to your phone or tablets around the globe!